Iveco announces the introduction of MY IVECO, the new, free app for smartphone and tablet designed for Iveco customers and commercial vehicle drivers. MY IVECO enables users to obtain complete information about Iveco products and provides access to a series of useful services. The app will be available in six languages (Italian, English, Spanish, French, German, and Polish) from the Apple App Store for iOS and in Google Play for Android. 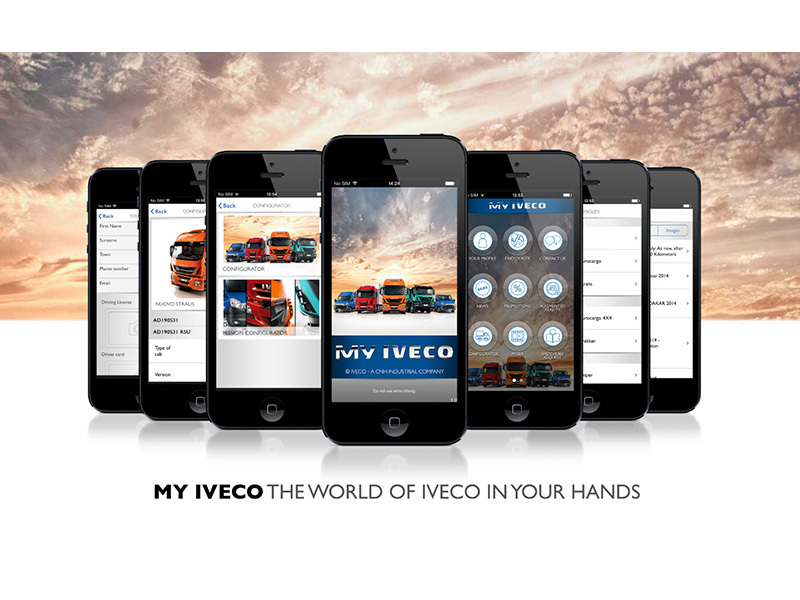 Navigating the app is simple and intuitive, allowing users to enter the world of Iveco with just one click. The main screen displays all of the features that users can select from in order to undertake a virtual voyage to discover the Iveco product line. Users can learn about a range of characteristics and technical data for all vehicle models, as well as access interactive services, such as a product configurator and geolocation to find a dealership. The Product Configurator, a valuable tool that is already highly appreciated by Iveco customers, it drives users through choosing the ideal model and configurations for their needs. From version to axle configuration, from engine power to suspension type, this tool always provides the best response to the various use requirements. By simply tapping on Find a Dealership, it is possible to locate the nearest dealership or authorised Iveco workshop and access the dealer's contact information. With Request Catalogue, users can choose the vehicle model they are most interested in and receive the relevant catalogue by email. Among other features, My Profile lets users customise the app by offering them the ability to enter their vehicle data and personal details, as well as record documents as their driver's licence and driver's qualification card. With the Promotions feature, MY IVECO keeps users up-to-date with the latest Iveco promotions, which are broken down by type and business. The content offered in this section is always in line with the on-going promotions currently in the user's designated country, and can be shared through various social media platforms. The app also allows users to stay informed on major company news through the News feature, while the Videos and Images area allows them to navigate to Iveco's official YouTube and Flickr channels. All app sections offer the ability to complete an information request form.